I like to work QRP CW and exclusively use home brew portable equipment. 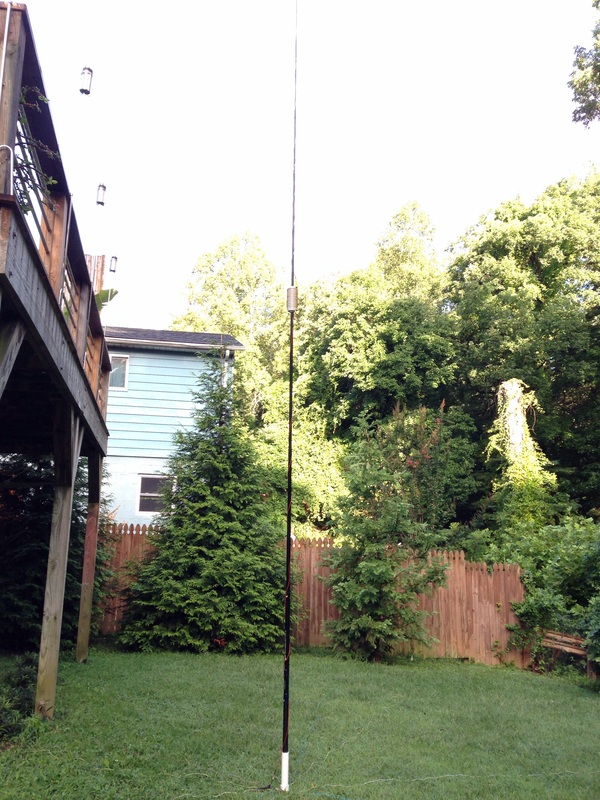 I have struggled with the best antenna to use for 40 meters. 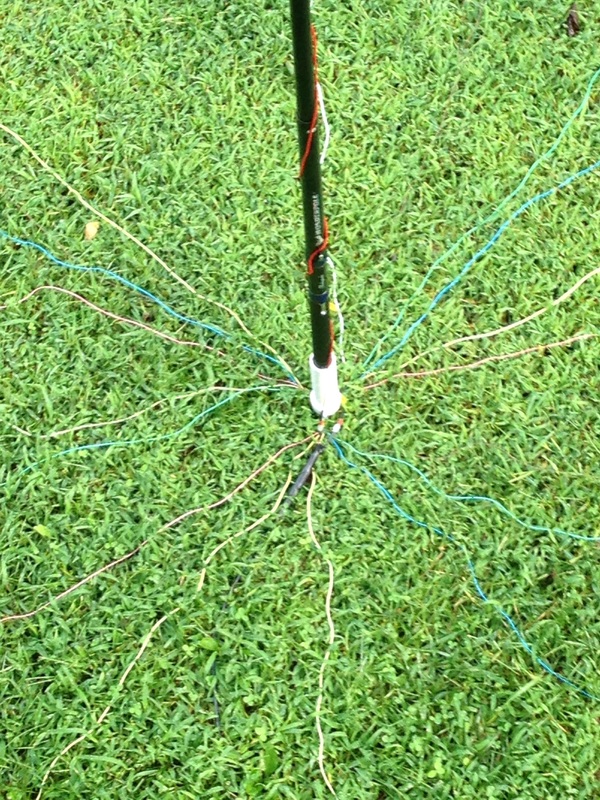 Wire antennas are lightweight and usually efficient but often require tuning, a structure or tree to install, and often end up low to the ground with poor DX performance. A 1/4 wave vertical is a good choice but is 33 feet long and requires lots of radials for acceptable efficiency. What I came up with is nothing new but I was able to verify good performance and efficiency. I have constructed a center loaded 20 foot vertical using a 20 foot collapsible fishing pole as the mast. The loading coil is wound with 12 gauge bare copper on a couple of PVC 2 inch couplings joined together. The coil is about 12 uH in value. Final tweaking is accomplished by creating a tiny loop at the top of the antenna(2 inches of area) that can be varied in size(create a small amount of capacitive top loading). The radial system consists of 21 ten foot radials. Since they are short the footprint is small and setup is easy. Using more short radials is more efficient than using a few long ones(up to a point). Unless you are going to use 60 radials or more there is no reason to have them 1/4 wavelength long. This is because current density is greatest at the feed point and diminishes as the radials extend out. Roughly, 24 radials at 1/10 wavelength long have the same performance as the same number of radials at 1/4 wavelength long. From my measurements with a network analyzer, the resonant feed point impedance is 30 ohms and calculated impedance with zero losses would be 18 ohms. So its on the high side of 50% efficient, which is good for a portable vertical. I have made a couple of cross continent contacts with good results using 1 watt, so I am pleased with the ease of install, small footprint, portability and effective radiating. Yes that’s great… years ago I remember when I was first getting involved in Ham Radio and was a green electrical engineer just out of school… I went to your web page a number of times(think you’ve modernize the format, but you have had a site for many years- right?) to get ideas for home brew circuits to try. I am really interested in offering circuit ideas that other experimenters can duplicate, play with our improve. I have some experiments with “popcorn” DSP you might find interesting. Currently, I am working on a complete dsp communication receiver which uses about 60 parts and fits on roughly a 3×2 circuit board. Hope to post the design soon. thanks for all the effort you’ve put into your site! You’re using an ATU in the shack to match it, correct? The feed method and impedance across the 40m band isn’t clear to me. Tweaking to what state, middle of the band? What are you shooting for? Thanks. The impedance is about 30 ohms with losses so I just connect to transceiver. The SWR is around 2:1. The bandwidth is is about 60 KHz so its centered around 7.090 MHz. 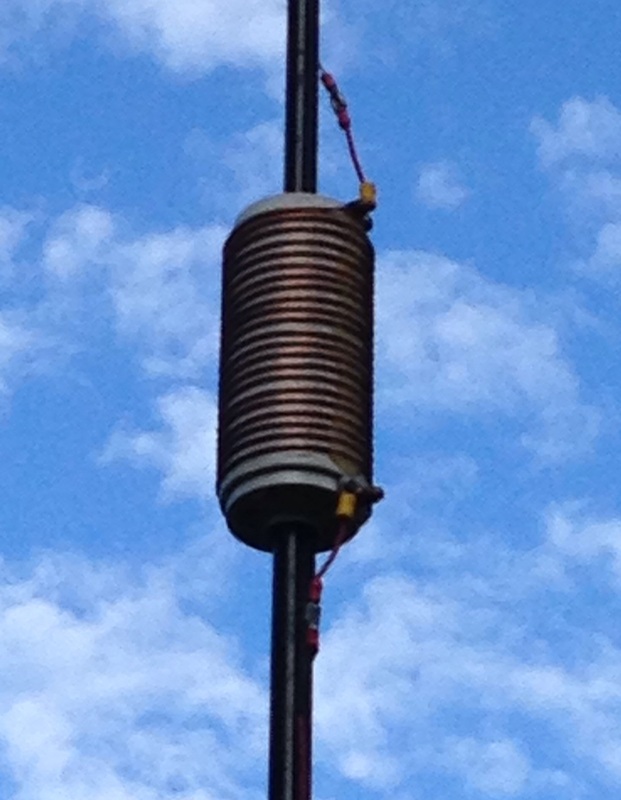 You might find some of my other antennas interesting on the site. I have a new version I will post soon without the coil and a cool CAP hat design.